We published a news story about this earlier today. But I wanted to share some more detail with you. Here are 7 ways that it’s now easier and better to use The Highway Code on GOV.UK. You can search within The Highway Code for the first time. Until now, when you searched, it searched all of GOV.UK. Some rules reference other rules. Now you can click on them and be taken directly to that rule, rather than just the section it lives in. The MUST and MUST NOT rules are based on laws. We’ve linked all these up, so you can now go and read the detailed regulations on the legislation.gov.uk website. All the laws referenced in The Highway Code have acronyms. Now, when you hover over these, the full name of the legislation appears. For example, hover over ‘MT(E&W)R’ and it displays ‘Motorways Traffic (England & Wales) Regulations’. For the first time, there’s now a list of the updates that have been made to The Highway Code. Now you can see what changed and when. 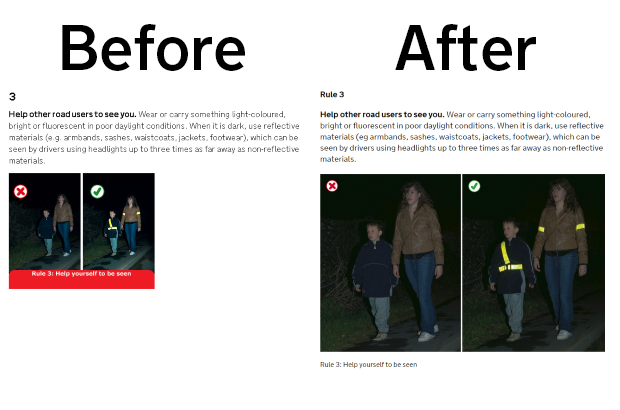 We’ve put larger and clearer versions of the images into The Highway Code. They’re still the same images, but now look much better. You can now browse images of things like light signals controlling traffic, traffic signs, road markings and vehicle markings on web pages. Until now, you had to download a PDF to see them. There’s still a PDF to download and print, though. Getting The Highway Code from the page to the road is a challenge we all share. We know that as soon as the L-plate hits the bin or the job as a driver is secured, few keep up with changes to the code or refresh their memories. Working in Cardington, I hear the fears that many of you express. Once your contact as someone's instructor or a trainer ends, their habits could change and their safety could be at risk. That’s why we introduced more ways to stay up to date in 2011, using things like email alerts, Facebook and Twitter. With over 50,000 Twitter followers, 38,000 Facebook fans and 41,000 email subscribers, that's really good news. We know that many of these people are there because you’ve been promoting these services over the past 4 years. Thank you for that. So now I have a plea for you. Keep promoting these services and explain the difference they can make. If you’ve not used them before, give them a try. Encourage your friends and family to take a look. 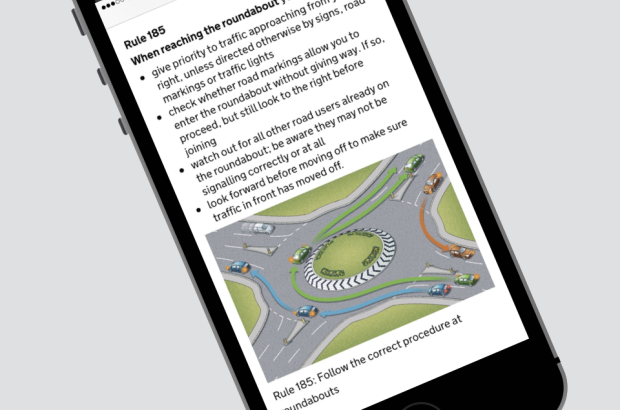 We’ll continue making more improvements to make it easier to use The Highway Code on GOV.UK. We’ll do the same for our reminder and update services. I’d like to hear how you’ve been using these, and what you think we can do to make them even better. It's fine updating the highway code , what you need to do is spend some time sorting out the council's planning departments and highways agencies so that road traffic signs and road markings are correct and consistent with the regulations and not haphazardly put on our next to the road. Making pictures bigger really isn't a help to people being taught to drive. Totally agree with Steve Pearce . The job done is good, but perhaps only 10% of what is needed to make driving better . Road marking and signing is a mess needing radical action - in some places it would be dangerous if you rely on it instead of using your own judgment . I believe some Councils have made a start - thankfully - it needs to be made a high priority everywhere . These new updates and ease of use are very good, well done. But there are still a lot of road signs, speed signs, and directional boards (even on motorways and dual carriageways) that are obscured or partly obscured by hedges and tree branches that have not been properly cut back. Missing a sign could get you a motoring penalty, or cause you to miss an exit, or to slow down and try to read a partial sign when you should be concentrating on the driving and the road ahead. Tree branches & hedge cutting is very important to road safety - it should be done regularly. Unfortunately, council cash cutbacks have led to little or no (hedge&tree) cutbacks! Ironic. Many thanks for your appreciation. Some of you commented on the management of traffic signs. The Department for Transport have recently consulted on the subject and they are analysing the results as I write. Here is a link to the consultation https://www.gov.uk/government/consultations/traffic-signs-regulations-and-general-directions-2016. New signage rules coming into force on the 22nd April ! Malcolm L. commented about Hedges and Trees that needed cuting back to display Road Signs etc., Dont forget a bucket, soap and water would help. I could name a number of Road Signs that realy do need a wash, and I dont mean just rain. Replacing warn out road markings where resurfacing has taken place is often in adequate. An example is a roundabout leaving Lichfield City towards the A38 roundabout on the Lichfield Rd. There are inadequate road markings to get in the correct lane in time on approach. There had been perfectly good ones previously directing drivers to the correct lane earlier but now we are just left with a road sign of which half to 2/3's is obscured by trees and upright sign that is too far away for none local traffic to have time approach correctly without a late sudden lane change as this on is an abnormal right hand lane for ahead. The left lane is left only but people frequently cut up the driver in the right lane as they move off partly for this reason & partly because they do not think it dangerous to wiz in front of the car positioned correctly for the sake of a few seconds advantage on their journey. Learners can find this very challenging. Many of my learners moan about the difficulties of getting to grips with badly positioned and inadequate road markings. They say often they don't know how to position because they cannot see them. it's all too easy as an experienced driver to be able to workout where to go, but for a learner, to remain safe post test & for non local drivers, these things to need to be better maintained. Maybe a fine could be introduced to councils who do not comply sufficiently well with road maintenance. Many roads are badly planned in terms of the time it takes for unfamiliar drivers to an area to be able to observe traffic and position safely. Much more care needs to be taken So that when changes are made for the better they do not inadvertently create a worse driving situation along side i.e. Prime example the widening of the exit slip road leaving the M42 north bound at Junction 10 for Tamworth. Immediately after this exit on the next stretch of dual carriageway, going east, there is an extremely short slip road with poor visibility on the corner. Previously the slower moving traffic In the Left lane gave a greater & safer opportunity for joining drivers to merge with traffic. But now the traffic is merging with the middle lane which is travelling generally at a much greater speed with more room for lane hoppers as I call them to take advantage. Yes it has alleviated peak time queues on the M42 leading to the slip but created accident potentially on the A5. When it was finished I informed many of my learners it was an accident waiting to happen. Sure enough within 6 months of completion because of the increases in speed a man known to one if my clients and father of 2 has been killed on that very slip road widen. With more thought to ALL traffic approaches this could & should have been avoided. The speeds of the A5 in this area have steadily increased lending to many more incidents & deaths this year. I for one believe it's time for camera & a reduced speed limit to late! Just today on the way to a client a little before 2pm on a busy Friday afternoon a people carried decided to pull up half on the grass verge half in the lane with hazards on simply to deposit his colleague off on the way home. This is a very busy 4 lane Traffic light controlled roundabout & I had to break quickly & was unable to complete my lane change because of it putting me in danger from tailgating drivers behind. He then proceeded to open the vehicle door into the middle of the lane. I was appalled & livid that this behaviour is allowed to continue unchecked because of no refresher training and a decrease in tafiic police enforcement. It was suggested by an ADI a few days ago that one way of making full licence holders more up to date with road knowledge is, in order to renew their photo card licence they should be made to pass the current Thery test. What a great idea I thought. Have you told the DVSA I said? !!! Update at conference was good. Thank you. We still have a long way to go to improve driver attitude & skills & knowledge.